The Wagon Wednesday tradition continues. While usually filled with candy, sometimes margaritas or ice cream sundaes take us by surprise. 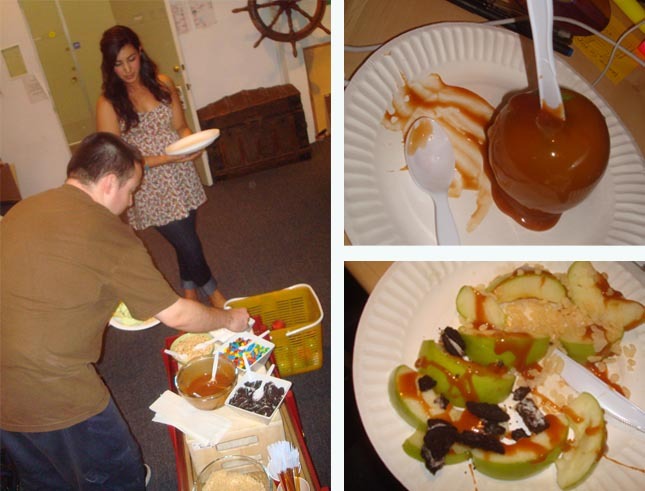 Today was another show stopper as Amia rolled in with fresh apples, homemade caramel dips and tons of toppings for caramel apples! Between the krispies, peanuts, marshmallows, chocolate candies and honey of today’s Wagon Wednesday we’re going to have to instill Diet Thursday pretty soon. Some dipped their apples classic style, others sliced and dolloped toppings, but both methods lead to sticky goodness! This entry was written by paulhanges and posted on August 26, 2009 at 7:44 pm and filed under Inside JibJab, Uncategorized. Bookmark the permalink. Follow any comments here with the RSS feed for this post. Trackbacks are closed, but you can post a comment.